Sand, sea, surf, sun... Phuket’s ‘S’ list goes on with savoury and soothing sensations, a whole lot of sucking, sipping and slurping. In case your imagination got away from you just now, know that we’re talking about smoothies! Indeed, a tropical island beach paradise without the offering of a refreshing, ice-cold real fruit-base beverage is like an ice cream sunday without the nuts and dripping chocolate fudge. Yet, through to the 1990s, most Phuket beach bartenders had little if any clue what a real smoothie was, let alone could serve you one. 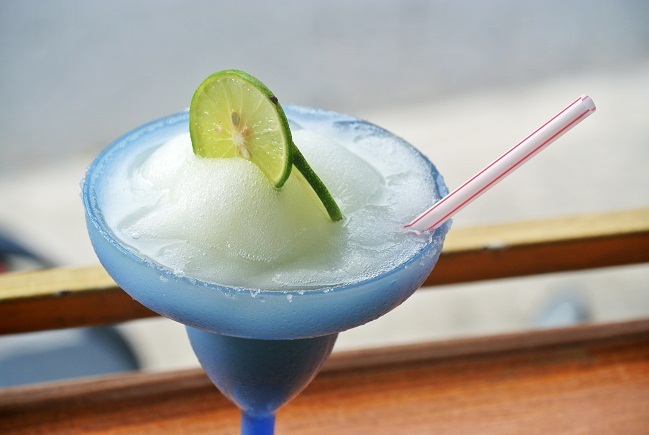 So when American entrepreneur Roy Sirota came to the island for a holiday in 1995, and couldn’t find a margarita that was worthwhile, he saw a golden opportunity. 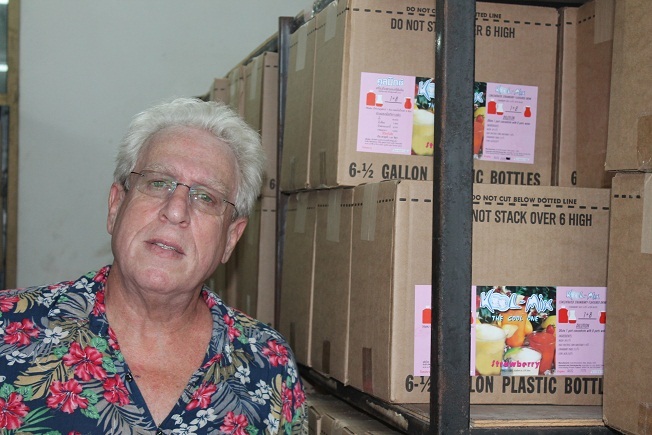 Two decades on, Roy’s Kool Mix business is booming, supplying hundreds of outlets across Phuket, Krabi and the gulf of Thailand, having standardised tropical Thailand’s smoothie trade to the delight of tourists and residents alike. The Phuket News recently spoke with Roy about Kool Mix. We formally got going around 2000. The approval process with the Thai FDA took about a year and a half. I found a factory in New York to supply the mix, using my logo. 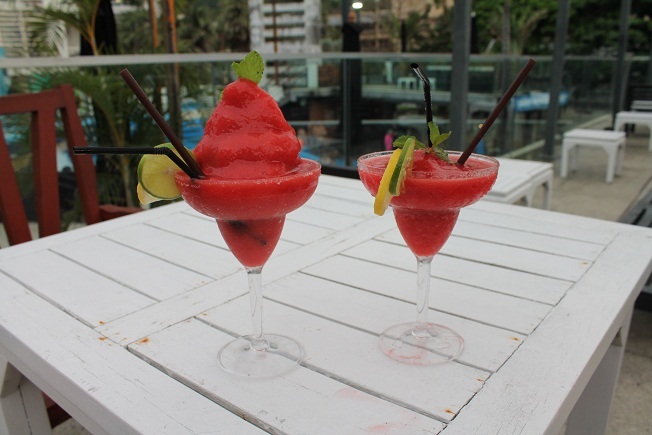 We started with four flavours that the factory recommended: strawberry, mango, margarita and pina colada. Why import the mix instead of sourcing locally? It’s a quality issue. For the same reason why one would import Häagen-Dazs to Thailand when you have Walls and Nestle. The product is premium. Real fruit, the meat of the fruit is in the drinks. I went out of my way to find the best quality supply. The beauty of this is there are so many things you can do with it. You can add yoghurt, ice cream, milk or alcohol as you choose. It works for the outlets in so many situations. It’s a real smoothie. So many bars and restaurants use the word smoothie but often they’re just serving a fruit shake. What’s the difference between a smoothie and fruit shake? The consistency of the ice and the way it is served. A smoothie would almost be like an ice cream that you can easily drink through a straw, whereas a fruit shake has larger chunks of ice. To make a proper smoothie, you need to use less liquid. Many bars can’t do this, they add sugar syrup and water – all the liquid to their fresh fruit. Our smoothies are just the mix concentrate and ice, and blended to the right consistency. What kind of options do you offer clients/outlets? We supply by the box, with the mix in 1.89 litre bottles. Clients can mix the flavours they want in a box, customise their order however they want. We now offer eight flavours. When making drinks, the concentrate is diluted with ice and the preferred liquid – be it water or alcohol, for example. The costs are relative to the size of the drinks they’re selling and can be calculated pretty easily. The margin can be tremendous. For example, a fruit drink might come out to B13 but could be sold for B65 for a 10 ounce (aprox. 300 ml) drink. But more important is the consistency. We standardise the drink so every outlet is making the same drink. We found that before, drinks would vary greatly at each bar, one might use more coconut milk here, or less pineapple juice or malibu there. There was no standard, customers weren’t getting the same pina colada. Even the same bartender might be inconsistent on one day, making the drink different. So we came in and showed them how to make drinks consistently. Indeed, for all of our outlets, customers, we go in and provide extensive customer support and training to ensure consistency – how big is the glass, how much mix and ice you should use in each drink. It’s all about doing it the same each time, as Starbucks would do. I came from the garment business. Every three months, fashion would change – the sleeve, the colours and styles would change and as a manufacturer I had to change with it. Then later, I started a hardware business, where I learned the value of consistency. Customers don’t want things to change, if something worked, there was no need to change/fix it. Same thing for the drink business. When clients find out that customers were coming back for a second drink, they realised ‘wow this stuff works’ cause they weren’t getting that from their drinks previously. So what kind of drink is this, really? This turned out to be, like in the states, a destination drink. Customers always want to go back to the place with the best drink, where they can throw up their hands and have a good time. That’s what this did for the outlets that didn’t know what they’d been missing. When you have 50 people sitting around the swimming pool and everyone buys one drink. All of a sudden you think you’re in the drink business. What they didn’t realise is that if it was good, they each would have bought two, three drinks, come back the next day and bought a few more. But, now they can see what a desirable drink can do, when it tastes right every time.